A Distant Moon by Erik DeLeo is the prequel to his Sentience trilogy. The novella introduces ex-fighter pilot Reg and his trusty robot sidekick RAUL (an unimaginative name for the mechanoid’s trade name Robotic Assistance Unit Limited) as they crash land on an uninviting and uninhabited moon. The narrative sets a frenetic pace as Reg struggles to survive in a less than friendly atmosphere and his robot unaccountably disappears. Severely injured and barely clinging to life, he is astonished to be rescued by creatures that would normally not hesitate to snuff out what little is left of his life force. But has he been dragged from the frying pan to be unceremoniously tossed onto the fire? And where the hell is RAUL? In his short prequel, Erik DeLeo launches you straight into an action-packed story line which keeps the pace moving at almost light speed right up to the last page. A Distant Moon is classic science fiction of the Star Wars variety where you will meet strange aliens and fly in fast spacecraft which will do battle with heavily-armed cruisers. Reg is a well-described, believable central character, maybe a little gung-ho and reckless but none the worse for that, and RAUL is an enigmatic robot, destined to play a pivotal part in the continuing series. The plot is well constructed with several twists to keep one’s curiosity alive and attention engaged. 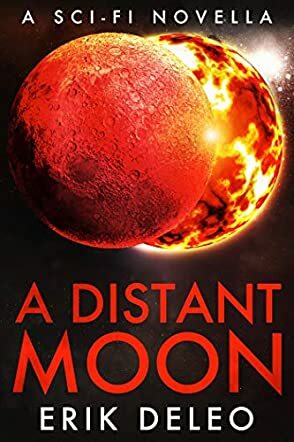 I greatly enjoyed A Distant Moon, a worthy addition to the genre, and I look forward to reading the stories that follow in the author’s Sentience trilogy.